Released only in North America. Game music is played from CD. On by default, disable with either nGlide or your graphics card control panel. In-game cutscenes are capped at 38FPS. Engine supports uncapped framerate, however mouselook is severely affected. Extract dgVoodooCpl.exe and dgVoodoo.conf to <path-to-game>, where SouthPark.exe resides. Open the MS folder in the dgVoodoo zip and extract DDraw.dll, D3DImm.dll, and D3D8.dll to <path-to-game>, again where SouthPark.exe resides. Make sure the Config folder / Running instance is set to <path-to-game>, it may already be there by default. In the General tab, set Adapter(s) to use / enable to your current graphics card, Appearance to Full Screen, and Scaling mode to either Stretched, keep Aspect Ratio or Stretched, 4:3 Aspect Ratio. In the DirectX tab, make sure Disable and passthru to real DirectX is unchecked, and set Resolution to Max. You can uncheck dgVoodoo Watermark if you wish. Optional: under Texturing, set Filtering to Force anisotropic 16x and set Antialiasing (MSAA) to 8x to enable anisotropic filtering and antialiasing respectively. Click Apply and exit the program. 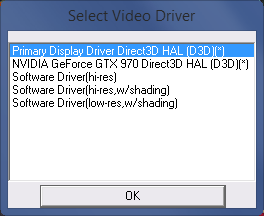 When starting the game up, choose dgVoodoo DirectX Wrapper Direct3D HAL (D3D)(*) from the Select Video Driver pop-up. If the game doesn't ask to change video cards, use the Change Video Cards button from the CD launcher. Snowball projectiles will only display the color they were first launched with (ie, yellow snowballs will be white if the first snowball fired was white and vice-versa). 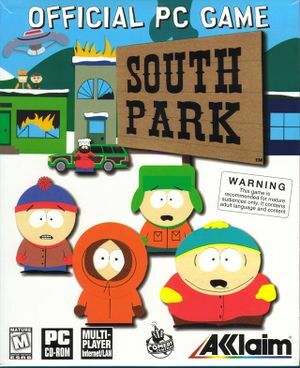 Download the South Park Glide patch from here. Extract the contents of southpark_patch.zip (southpark3.sdb, PatchUninstall.bat, and PatchInstall.bat) to <path-to-game>, where SouthPark.exe resides. Double click PatchInstall.bat to install the patch. Run nGlide from the Start screen/Start menu and change the resolution and other settings. 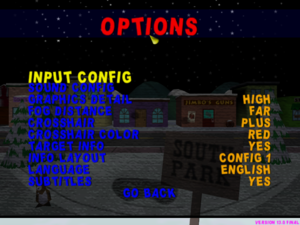 When starting the game up, choose 3Dfx Custom Driver (Recommended) from the Select Video Driver pop-up. Set aspect ratio to 4:3 for a letterboxed output or to fit to screen to stretch from 4:3. Called "Speed". On a scale of 1 through 9, with additional 'Slowest' and 'Fastest' settings. 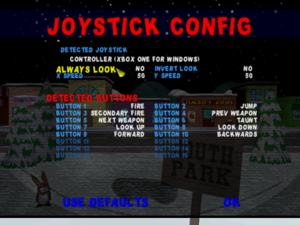 Cannot exit Joystick Config since pressing buttons will make the cursor go to the respective button that was pressed and change its binding. Cannot map a pause function to any button. 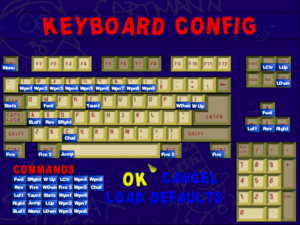 By default only 10 of the 16 available buttons will be mappable. Controller must be plugged in when starting the game. SFX and Music volume, from 0 to 10. Music can be toggled on or off. Sound effects stop but music continues playing; game continues playing. 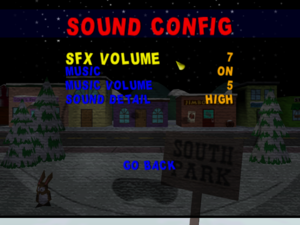 Pause the game, go to Options, Sound Config, and turn the music off then back on. hackable See Increase Rendering Resolution. 640x480, 640x480 w/shading, and 320x240 w/shading. 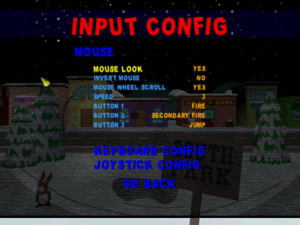 Mouselook is disabled when using these options. *Readme specifies 120 MB for HDD space while the retail case specifies 95 MB, which is closer to the full installation size (49.5 MB). This page was last edited on 15 April 2019, at 11:39.